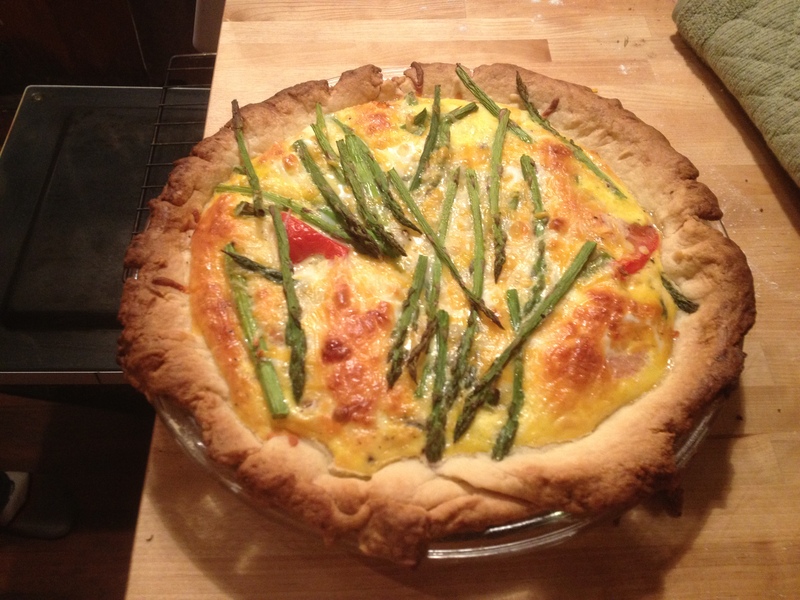 The simple quiche! Fast, fresh, easy and local! If you have your own chickens or if you can get some fresh, free range type from your local neighbors, here is a recipe that is easy, changeable, fast and works every time! I have made hundreds of these so it’s well tested. This is a great recipe to use what you have in your garden, especially if you have chickens or access to some local egg sources. Impress your family and friends of your culinary skills with this dish. In a separate bowl, whip 4 eggs and add 1/3 cup milk. Using a glass, pie pan (well worth the investment of a few dollars at a grocery store), either create a crust by hand or defrost a store bought one and place it at the bottom of the pan. If you don’t have the crust or don’t want the crust, that is fine too – Just add the ingredients and the egg/milk combination. Place quiche fillings in crust. My favorite is asparagus, but whatever is in season, and add some shredded cheese (about 1 cup) to it, the more types of cheeses the better. No need to precook anything. Vegetable fillings that have more moisture in them will take longer to cook and may create a lot of water in your quiche. Throw in some tomatoes, small bits of onion or other spices. Feel free to experiment. Do you have some left over cooked potatoes? Blend egg/milk mixture right before putting it into the pan and then add to pan with quiche filler in case the eggs and milk have separated a bit. Place in the oven for only 35-45 minutes.. check it after 40 minutes. It will cook a bit upon coming out of the oven. Crust and top should be golden brown. Cool for about 5 minutes. Cut and serve. Serves about 4-6. Avoid using crusts in aluminum pie tins.. glass pie pans works better and no waste and very affordable. You can taste the difference between local eggs and store production eggs in color and flavor so buy some quality eggs for your quiche. Share and cook this recipe with friends and family.